Google’s been working on a new innovation in the smartphone world with Project Tango, a prototype smartphone that would be able to read and map a room. This prototype takes “a quarter million 3D measurements every second” to create a 3D map of the indoor environment on the phone. Using new technology customized for the prototype, the phone can capture an environment in real time as the user holds and moves the phone. 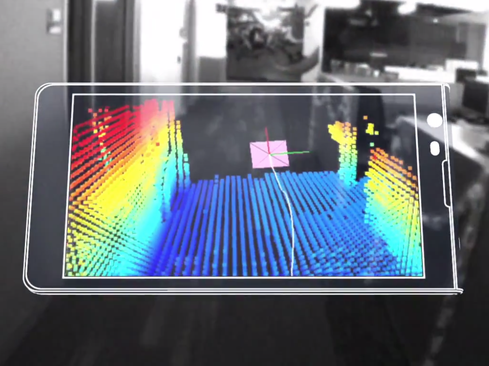 What could you do with a 3D indoor-mapping smartphone? If you owned a phone with Project Tango capabilities, buying new furniture could be as easy as taking a picture. Instead of measuring every inch of your house to see what furniture would fit, you could map your house on the smartphone and get all the measurements you need to take with you to the store. Gamers are excited about the virtual gaming possibilities presented through Project Tango. Google encourages gamers to “imagine playing hide-and-seek in your house with your favorite character, or transforming hallways into a tree-lined path”. The possibilities are exciting as this new hardware and software development could help transform your own house into a virtual gaming environment in a world of its own. Have you ever gone to a physical address, only to realize that the business or person you are trying to find is somewhere within a massive building? As you wander aimlessly, trying to figure out the rest of the way, wouldn’t it be great if you also had an interior map to help? The Project Tango technology could map the inside of buildings, maps which could be used to help yourself and others find their way in new structures. Trying to shop in a hurry is the worst. If you have any trouble finding the items you’re looking for, frustration sets in, and it will probably be the one time where the otherwise attentive staff are nowhere in sight. Project Tango could make it possible to search for a product and see right where it is located, down to the “exact shelf […] in a super-store” . This ability would be perfect for those times when you’re in the huge office supply store and feel silly because you can’t find the aisle with paper or for when you need to quickly grab that ingredient in an unfamiliar grocery store. Project Tango isn’t all for fun and games. Google also sees the possibilities it has for assisting the blind. Interior 3D maps could help those with visual disabilities navigate through unfamiliar buildings without assistance through the use of auditory cues on the smartphone. Ready to grab your 3D-mapping smartphone now? Watch the video introduction to Project Tango on Google’s Project Tango site.